Maurice Malpas refused to be drawn on whether he will follow Terry Butcher to Hibernian should the manager leave Inverness Caledonian Thistle. 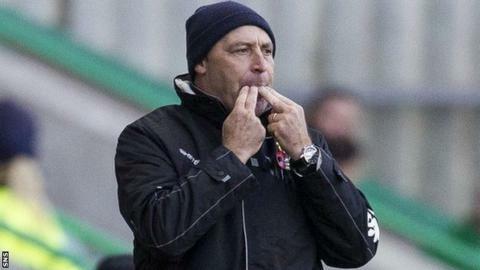 "I don't have that decision to make yet," assistant Malpas said after Caley Thistle defeated Hibs 2-0. "It is up to Terry and the two clubs to negotiate and come to some decision and, once that happens, I may or may not get involved after that." Butcher was in the stand at Easter Road and is expected to join Hibs next week. Malpas also could not shed light on whether Butcher has already agreed to join Hibs. "There's a decision to be made between the three parties - Inverness Caley Thistle, Hibs and Terry - and, until that's done and they come to some decision, it is just speculation," he told BBC Scotland. Malpas waxed lyrical about the quality of the side Butcher would leave behind and who leapfrogged Aberdeen into second spot following their victory in Leith. "I think this season they've been outstanding," We've kept the boys together from last season, there's only a couple of new players playing, they've got energy, they've got legs, but the biggest thing they've got is heart. "I don't think any team will come nears us in work-rate, no team will come near us in terms of fitness and that's down to the players. "We can whip them, but if they don't want to do it, they'll never get any fitter, they'll never get quicker, they'll never get better. "And, by god, do we whip them and, by god, do we get a reply back." Malpas thought his side thoroughly deserved a victory that was never in question after early goals from Nicky Ross and Billy McKay. "I thought it was a fantastic performance," he said. "We started the game brightly and, once we scored our two goals, we were rampant for a little while. "Every time we attacked them on the break, we looked like we could score and the boys deserve every credit. "With the hullabaloo that went on before the game, they went out and showed what true professionals they are."